Hey Everyone!!! I don't know about all of you, but didn't Spring feel like it was a long time coming?! I am just so glad it is FINALLY here!! We wanted to thank everyone for being so patient as we are working on getting new and exciting ideas for you all to see and hopefully recreate for yourselves!! Also, keep watching for news concerning an open call for our Design Team!!! 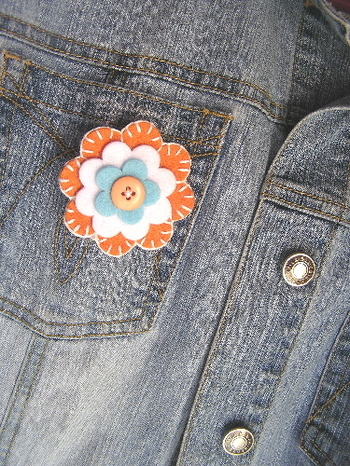 I absolutely loved what the so very talented Vicki Chrisman created with Fancy Pants Fashion Sense Felt and Buttons!!! 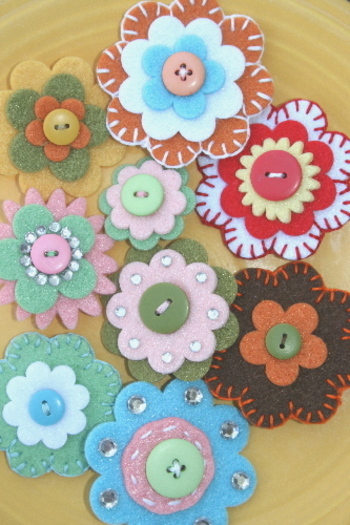 Vicki was able to create these darling little girl hair clips, as well way cute flower pins! What a great idea!! I just love the colors!! Perfect for this absolutely wonderful time of year!!! Thanks so much Vicki for sharing these super cute ideas!! Weekly Projects, Ideas and More!! While we don't have a full new design team in place yet, (watch out for a call coming very soon--we're looking to add on some new design team members here at Fancy Pants :)) we are in the works of getting weekly projects together to share with you ...You'll enjoy project ideas from a variety of awesome scrapbookers ready to give you some creative energy!!! This project idea is a lot o f fun and can be very useful for a number of things! It's not a new concept, but we hope you'll discover some fun ideas and creativity!! 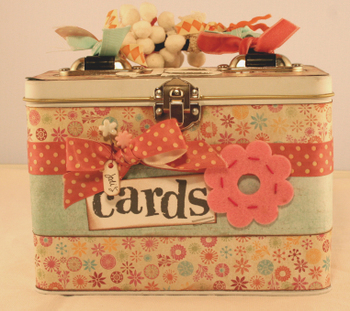 We love the idea of this cute little lunch box all decked out for card organization. This can be applied to storage of photos or your favorite recipes as well! 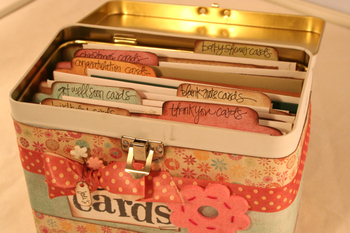 Jodi used a Provo Craft lunch tin to decorate the organizational bin for her cards! This is a simple project that doesn't require a lot of product. 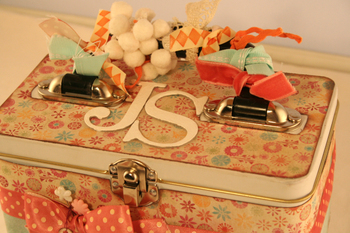 The outside can be created using just 2 sheets of paper, some miscellaneous ribbons and embellishments! Jodi used the Daisy paper from our Botanical Collection, along with ribbons from the Botanical, Sweet Pea and Celebrate collections! 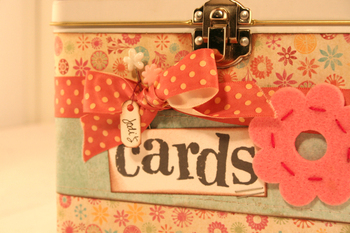 The 'cards' title was made using the Doodles and Things 12x12 stamps from our latest release! On top, she used our Lotsa Letters set to put her initials...the additional embellishments are the flower felt shape and straight pins from our Fashion Sense Splash collection! Now, all you have to do is fill it up with handmade cards (now that is the hard part)!